Breck Park Estates homes for sale are located in one of the highest subdivisions in the Breckenridge area. These properties are the last to see the sun go down behind a panoramic view of the Tenmile Range. If trains still ran as they once did from Como to Breckenridge over Boreas Pass, one would be within an easy walk from any of the homes that have been built in Breck Park Estates - albeit built after the last train passed. Cabins were built in the Breck Park Estates area during the mining boom of the 1880s, and a few remnants remain. But the first of the ski-era homes were built in 1963. This makes Breck Park Estates one of the earliest developed neighborhoods in the Breckenridge area, but one that still has a lot of potential. 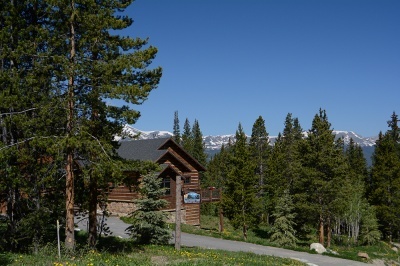 Browse available Breck Park Estates real estate listings below, or learn more about this popular community, located high above Boreas Pass Road. Since many of the original Breck Park Estates homes were built as small, second houses on more than one-half acre, and because nearly a third of the homesites are still undeveloped, this neighborhood retains an aura of potential. And seclusion. Dense forests offer privacy and a woodsy, natural setting. This subdivision is not inside the boundary of the town of Breckenridge, so the homes make use of environmentally sound well and septic systems because city service aren’t offered up here. And there’s no real estate transfer tax, either. Instead of trails, these homes now have easy access to the scenic byway that is Boreas Pass Road. In the winter, Boreas is closed to cars after Breck Park Estates, and is used as a wide and gentle ski or snowshoe trail. 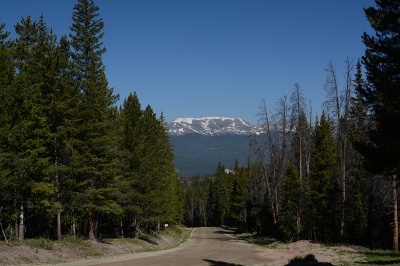 In summer, the road is an easy, unpaved route over Boreas Pass to South Park. By autumn, the area between Breck Park and the pass will be an excellent place to see the colors change and Aspens quake. From the neighborhood, connections can be made to mountain bike and hiking trails on Baldy Mountain, across streams, through historical mining areas below Boreas Pass, and down into the Wakefield meadow near town. These trails also serve cross-country skiers and snowshoers in the winter. Size (low/high) by square footage: 528 sq. ft. to 3853 sq. ft. Amenities: adjacent to national forest, Nordic ski-in/out, views, easy access to several trails, base of Baldy Mountain, yards from Boreas Pass trailhead, well and septic, large lots. Breck Park Estates is located on or near Boreas Pass Road close to the end of the county’s winter road plowing. 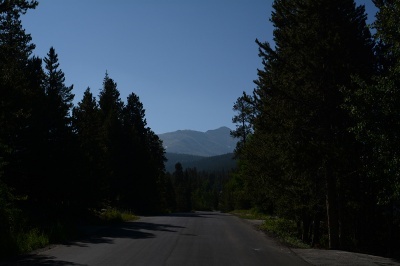 At the south end of Breckenridge, turn east on Boreas Pass Road and follow it southeasterly for about three miles to the junction with County Road 528, which will be on the left. Many of the homes and lots in Breck Park Estate are located off CR 528, but for some you must continue on Boreas Pass Road. A few lots are accessed directly from this road, but to find most of the remaining homes, turn right on CR 529. We would love to talking to you about Breck Park Estates homes for sale. Contact us today and we'll help you find your next dream home!